This photo (probably taken before 1901) shows Prince Albert Row on the left, some of the overcrowded housing in the middle, and Short Lane on the far right. The Boot and Tinkers End Cottage are just visible in the distance. The road was widened in 1935 after many years of complaints. The earliest reference to the name Tinkers End which we've found so far is from 1698. There is no sign of it on the 1599 map, but that doesn't necessarily mean it didn't already exist then. The only surviving 17th-century building is Tinkers End Cottage (3 Granborough Road). Another was replaced by The Boot (1 Granborough Road) in the 1830s. The lane leading from Granborough Road towards The Walk known as Short (or occasionally Short's) Lane had a brickyard, and a number of houses on the site now occupied by 7 Granborough Road. On the west side of Granborough Road, Prince Albert Row or Albert Place (30-36 Granborough Road) was built in 1840, and there were other houses on the sites occupied by numbers 24-30A, with a "tin tabernacle" where the entry to Chiltern Court is now. Granborough Road itself was usually known as Claydon Road. Tinkers End underwent drastic population growth in the mid-19th century. This seems to have been achieved mainly by subdividing existing houses, leading to very poor living conditions. 6% of Winslow's population lived there in 1851 and 7% in 1871. The inhabitants were nearly all low-paid agricultural workers, many from the same families for several generations (e.g. Holt, Saving, Turney). Tinkers End was seen by some of the respectable residents of Winslow (who actually owned the slum properties) as an outpost full of infectious diseases which needed its own mission church. The creation of the Rural District Council with its Sanitary Inspector led to the gradual demolition of the worst housing; there were 25 households in 1871, 13 in 1911 and 9 in 1939. The information below has been divided into sections. Please click on the links to go directly to them. Coroner's inquest. At Tinker's End, in the parish of Winslow, on view of the body of Ruth, wife of John Walker, labourer, who, being left alone for a short time in the evening, fell into the fire ... Verdict -- Accidental Death. On Monday, the 20th inst., an inquest was held at the Boot public-house, in Tinker's End, before F. Budd, Esq., deputy coroner, on the body of Elizabeth Ann Foskett, aged five years, who was burnt to death on the Saturday previous. It appeared in evidence that the deceased and another child were left in the house together whilst the mother (who had nothing in the house for dinner) went to Mrs. Stairs' to borrow some bread, and when there the little boy rushed in and told her that Lizzey was on fire; she ran home as quickly as possible, but the child had everything burnt off by the time she arrived, and died almost immediately afterwards. Verdict -- "Accidental death." In Dr. Hunter's recent report the following remarks occur:- "At Tinker's End, near Winslow, in Buckinghamshire, I saw a bedroom in which slept four adults with five children, and which measured 11 feet by 9 by 6 feet 5 inches at the highest point; another was 11 feet 7 by 9 by 5 feet 10, and contained six persons. Each of these families had less than the allowance necessary to one single convict. No houses had more than one bed room, none had any back door; water was very scarce; the rents from 1s. up to 2s. In 16 houses visited, only one man could be heard of who could earn above 10s. a week. The reservoir of air alloted to each person in the case mentioned may be described as about equal to his being shut up all night in a box four feet cube; but of course the miserable old huts were well provided with unintentional ventilation." 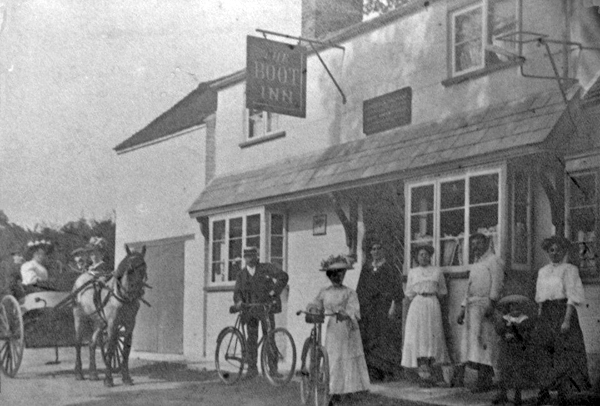 On Saturday, May 10, at the Plough Inn, Winslow, before R. D'Ath, Esq., Coroner, an inquest was held on view of the body of Harry Saving, aged three years, son of Harry Saving, farm labourer, who was drowned in a pond in Tinker's End, on the previous evening. From the evidence of the father it seems deceased went out to play at "tip-cat" just as the mother started on some errands. The child said, "I am going to auntie's", the aunt living just opposite the pond. -- Charles Walker said he was driving into Winslow from North Marston when he saw something in the pond ... Samson Smith, an uncle of the child (also called as a witness), ran out of his house and got the child out of the water immediately ... The pond was fenced round, as other children had previously fallen in ... Verdict: "Accidentally drowned". ... At 10 o'clock the [Salvation Army] soldiers met at the Barracks, and with the band to the front marched to Tinker's End, where a meeting was held for about half-an-hour, during which time the Capt. and Lieut. farewelled, the Capt. remarking that Tinker's End would always have a warm place in her heart. A case of typhoid fever was reported [to the Board of Guardians] in Tinker's End at Winslow, and the inhabitants of of some of the dwelling there were described as living more like pigs than human beings. It is true that in some instances the dwellings of the poor are in a delapidated [sic] state; but it is equally true that some of the inmates are far from clean, and thereby largely add to the insanitary state of the places. The Medical Officer (Dr. T.F. Vaisey) reported as the result of a visit to Tinker's End that all the cottages previously complained of were old, but the tenants said they could not pay any higher rents. There were three empty cottages in the district. Winslow Rural District Council. Mr Wise reported a case of overcrowding in a cottage occupied by Henry G. Walker, Tinker's End, Winslow. The father, mother, and daughter (aged 18) and son (aged 16), and a baby (aged 2 years), all slept in one small bedroom. The daughter was going out to service. The members said it was a very bad case, but they could not deal with the moral side of the question. Mr Wise reported another case of overcrowding at Tinker's End in a cottage occupied by Thomas Saving. The father, mother, and four little children, all under 5 years of age, slept in one small bedroom. In this case there was another small room which could be made into a bedroom. Then I think Tinker's End Feast was held on that day for all the sweeps and the bakers used to parade the town in the morning with their Jack-in-the-Green and Dicky Loveridge dressed up as a woman, their fiddler and old Mrs. Smith carrying the money box, and then at night, Tinker's End wasn't half lively. The spectacle of a large Greenham giant navvy at work on the road widening operations at Tinker's End, Winslow, has created some interest. Winslow Rural District Council. Mr Monk said that they wanted more houses in Winslow and the Chairman agreed observing that they had ground there and they might as well build on it. ... The Sanitary Inspector [re overcrowding] had in mind an old cottage at Shipton and two at Tinkers End. Mr Monk: I understood they were all condemned at Tinkers End. Google Earth view of Tinkers End showing Prince Albert Row (left) and the former Boot (furthest white building). Below, you can see Tinkers End and Granborough Road on the 1880 and 1978 Ordnance Survey maps. Only Prince Albert Row, The Boot and Tinkers End Cottage (the last two much altered) are on both maps. Names and occupations of heads of household are listed. The road names used by the enumerators are shown in bold. Sometimes the enumerator started from The Walk, sometimes from Tuckey Farm and sometimes from Western Lane, so the houses are in a different order each time. In 1891 and 1901 the number of rooms in each house was listed if fewer than 5; in 1911 it was listed for all houses. 1 unoccupied Tom Saving, general labourer, 3 rooms Boot Inn: Burgin, A.J. Jabez Cook, shoemaker, 4 rooms Elizabeth Saving, 3 rooms 5 Averay, O.G. William Holt, ordinary agricultural labourer, 4 rooms Thomas Anderson, hawker, 4 rooms 8 Phillips, E.
William Saving, cattleman on farm, 4 rooms Jabez Cook, bootmaker, 4 rooms 10 Willmore, M.A. George Holt, carter on farm, 4 rooms Tinkers End [east side]: 11 Welsh, Jas. Short Lane: Thomas Turney, farm labourer, 5 rooms 12 Matthews, T.
The very early (1698) reference to Tinkers End seems to concern what is now Tinkers End Cottage, which enables its ownership to be traced in some earlier court rolls. Thomas Lee gent. and Katherine his wife surrendered a cottage in Winslow and pightle adjoining it with hades, now in the tenure of John Yates and Edward Bott [=Budd]. To the use of Peter Fige jr gent. Fine 5s. Peter Fige jr gent. and Martha his wife surrendered a cottage in Winslow in the occupation of Edward Budd and John Yates with hades. To the use of John Hobcroft and Katherine his wife and John's heirs. Rent 2d, fine 5s. Thomas Pease surrendered a cottage. To the use of John Hobcroft on condition that the surrender will be void if Thomas pays him 14s 4d on 29 Sep 1664 and 1665 and £12 14s 4d on 29 Sep 1666. Rent 2d, fine 5s. John Hobcroft surrendered a cottage with The Backside to the use of Thomas Pease. Rent 2d, fine 5s. Thomas Pease and Elizabeth his wife surrendered a messuage in Winslowe with all buildings, yard(s?) [penetral'], orchards and gardens. To their own use for their lives, then to the use of Thomas Kinge son of Walter Kinge of Middle Claydon farmer. Rent 2d, fine 5s, heriot 5s. Henry King, who held a messuage in Winslow in reversion after the deaths of Thomas Pease and Elizabeth his wife, died since the last court. Henry King his son and next heir sought admission. Rent [blank], fine 5s, fealty respited. Samuel Willstone surrendered his domicile in Winslowe with orchard adjoining. To the use of Daniel Gyles, on condition to be void if Samuel pays him £10 6s on 20 Dec next at Daniel's domicile. Samuel Wilston surrendered part of a bay of structure in Tinkers End in the occupation of Thomas Goodier with the way or passage on the west side of the bay (reserving always to William Gibbs free passage over and through the said passage). To the use of Thomas Blake gent., Richard Bigg gent., John Henley and Augustine Seaton on special trust that they permit the vicar and churchwardens and overseers of Winslow to expend and disburse the rent and revenue of the premisses for the use and benefit of the poor inhabitants of the parish of Winslowe in perpetuity. Samuel Willson on 22 Aug surrendered all his standing and right in a cottage in Winslowe where he now lives, with orchard. To the use of Robert Eden of Winslow, carpenter. On condition to be void if Samuel pays him £5 2s 6d on 3 Feb next at Robert's domicile in Winslowe. Samuel Wilston and Daniel Gyles surrendered a domicile in Winslow with orchard adjoining in which Samuel Wilston and Thomas Goodger now live. To the use of John Stevens and Jane his wife, who sought admission. Rent 2s, fine 5s, heriot by composition 2s 4d. William Gibbs out of court on 25 March last surrendered a cottage in Tinkers End in Winslowe now in the occupation of himself or his subtenants, containing 2 bays of structure, with barn, yard, orchard and backyard. To William's use for his life, then to John Gibbs and Ann his wife in perpetuity. 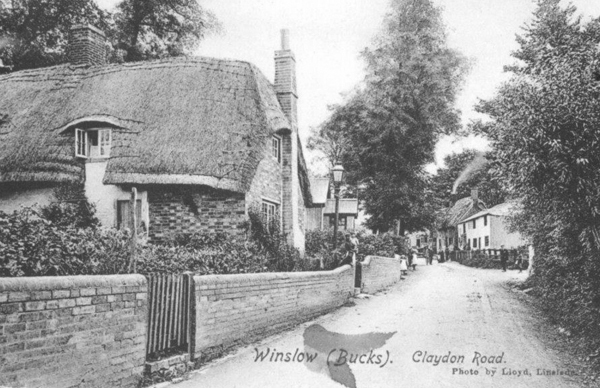 In 1837, among the cottages put up for sale by the Winslow Guardians were two thatched cottages in "Claydon Lane" in the occupation of John Reading and John Dumbleton. One must have been the property donated by Samuel Wilston in 1709 (perhaps as part of an agreement with the overseers), and the other could be John Gibbs' cottage. The unusual arrangement made by the churchwardens and overseers in 1724 could be due to their already owning part of the building. Sale of property of the late Mr Silvanus Jones. Lot 2. Two copyhold cottages at Tinkers' End were sold to Mr. John Watts for £50. The property which became The Boot was the house of Samuel Miller in 1700 (but can be tentatively traced back further). It passed to his son, granddaughter, then a younger son. Ralph Noone, customary tenant, and Susanna his wife surrendered half a messuage in Winslow. To the use of Samuel Miller and Mary his wife. Rent 2d, fine 5s. Elizabeth Tymes widow surrendered and remised to Ralph Noone all title and interest which she had in a messuage in Winslow late Ralph Udden's. Samuel Miller & Hugh Miller desired to be admitted Tenants to a Mesuage in Tinkers End in Winslowe late in the occupation of Elizabeth Miller widdow (their late Mother deceased) which came into the hands of the Lord upon the death & surrender to the use of the last Will of the said Elizabeth ... [quotes will] ... Afterwards Samuel & Hugh Miller surrendered the said Mesuage to the Uses hereinafter mencioned: the South End conteyning a Lower Roome and a Chamber over the same and also that part of the Yard which is now staked out & laid to the said South End to the use of the said Samuel Miller. The other part of the said Mesuage being the North End consisting of a lower Roome & Chamber over the same and also the Outhouse and that part of the Yard which is now staked out and laid to the said North End to the use of Joseph Bliss & Mary his Wife. Joseph Bliss late of Winslow labourer and Mary his wife while they lived held the north end of a messuage in Tinkers End consisting of a Lower Room and Chamber over the same and also the Outhouse and part of the yard staked out. They died so seized and Thomas Bliss of Winslow labourer is their only son and heir. He was admitted tenant. He then surrendered to Nicholas Higgins and Elizabeth his wife [nee Goodman]. Elizabeth present in court was admitted tenant. Before I left Swanbourne I endeavoured to get some boys from thence, Winslow and Mursley, to go with me to Portsmouth, and though I talked to the overseers of the parishes, and the boys themselves, particularly two from Winslow, who came to me for relief, the sons of a man of the name (I believe) of Higgins, whom you discharged at my request from the militia; still I could not persuade any of them to go, nor did any of the overseers dare to urge them on the subject. Nicholas Higgins, late of Winslow Labourer, who while he lived held All that north end of a Messuage or Tenement in Tinkers end in the parish of Winslow aforesaid consisting of a Lower Room and Chamber over the same and also the outhouses and that part of the yard which was heretofore staked out and laid to the said north end … now in the tenure or occupation of William Higgins ... lately died so seized thereof and Intestate. William Higgins of Winslow Labourer eldest Son and Heir .. desires … to be admitted Tenant. Both parts of the original property were bought by Thomas Lomath, cordwainer and constable of Winslow. The earliest photos of what became The Boot show a stable or trap-house and a large building with a slate roof (built in the 1830s to replace the Higgins dwelling), and two small cottages, one tiled and one thatched (see the 1927 document below), which must be the south part of the original messuage inherited by Samuel Miller in 1733 and subdivided further (see below). Robert Eden of Bottle Claydon [see below] held a messuage in Tinkers End then or late in occupation of John Saving with the lower part of the garden and yard adjoining. He bequeathed it after the decease of his wife to his daughter Elizabeth wife of Richard Scott. Elizabeth is since dead. Robert Scott is her eldest son and heir, and desires to be admitted. Robert Scott of Winslow Cordwainer and Elizabeth his wife surrendered a Copyhold Messuage in Tinkers End heretofore in the Occupation of John Saving and now or late of Augustine Seaton, with the Garden and yard adjoining. To the use of Jasper Duckett of Banbury Pedlar, who desires to be admitted Tenant. Jasper Duckett of Winslow Pedlar and Mary his wife in consideration of £20 paid by Thomas Lomath of Winslow Cordwainer surrendered a copyhold messuage in Tinkers End heretofore in the occupation of John Saving, late of Augustine Seaton, now of Jasper Duckett, with the yard and garden adjoining, to which Jasper Duckett was admitted on 28 Oct 1789. Rent 2d, fine 5s. To the use and behoof of the said John Hobbs. If Thomas Lomath pays £100 with interest at 5% on 23 September next, this Surrender to be void. This Boot was first licensed in 1835, but there was another Boot in Winslow in the 1750s (evidently on a different site) and an even earlier one on the site of Winslow Hall. The pub name was common in the area because of the legend of Sir John Schorne of North Marston, but The Boot in Tinkers End was certainly not built for pilgrims. Instead it became a "common lodging house", often accommodating large numbers of people including locals as well as itinerant workers (see the Census returns). THURSDAY, March 14 – Before Mr. Baron VAUGHAN. Thomas Jones, George Briggs, and Henry Weller, were charged with uttering counterfeit coin at the parish of Padbury. Mr. Roberts appeared for Briggs. Mr. Maltby and Mr. Birch prosecuted. Jane Collier examined. – I live at the King’s Head; recollect two of the prisoners coming to our house; they had two young women with them; they asked for beds; they were the whole night and the next day. The prisoners Jones and Weller were identified by several witnesses as being together at several places endeavouring to pass base coin. Mrs. Tuckey of Winslow, who keeps a beer shop, identified the three prisoners as being together at her house endeavouring to pass base coin. The Jury acquitted Briggs, and found Jones and Weller guilty. Sentence – one year’s imprisonment each. Briggs was again indicted for having three counterfeit shillings in his possession. Thomas Lomath, constable of Winslow. – In consequence of information I received I went to the Boot beer shop; I apprehended three persons; I afterwards apprehended Briggs; I found him at the public house; I cannot say if he was there when I apprehended the others; in consequence of information I received I went with Loveridge and took a bag out of the thatch; I have had it in my possession ever since. Cross-examined. – It was about three or four o’clock in the afternoon of the next day I made search; Loveridge was in the beer house when Briggs was apprehended; I told Briggs what I came about; the Loveridges were in the house in the evening; there were many persons in the room when I apprehended Briggs; I took Weller and Jones on suspicion of passing base coin; Briggs met them, when Loveridge swore to seeing Briggs place some base coin in the thatch of Tuckey’s beer shop. Verdict – Guilty. Sentence – eighteen months’ hard labour. The license of the Boot, at Winslow, was transferred from James Tuckey to Thomas Lomath. On 1 April William Jarvis of Winslow labourer & Martha his wife surrendered a messuage or cottage in Tinkers End then in their own occupation, and all estate and equity of redemption. To the use of Robert Eden of Winslow, cordwainer. Rent 3d, fine 5s. Ann Eden of Winslow widow & Robert Eden of Winslow Cordwainer on 15 Feb 1777 mortgaged for £30 to Alice Gascoigne of Little Horwood widow 2 messuages in Great Horn Street and 2 messuages in Tinkers End in the occupation of Mary [blank] widow & Francis Savage. On 27 July Joseph Robinson of Aylesbury Taylor & Elizabeth his wife surrendered a Cottage in Tinkers End in the occupation of John Evans and all Houses Outhouses Edifices Buildings Barns Stables Yards Backsides. To the use of William Turner of Winslow Lacebuyer. Rent 2d, fine 5s. Centre for Bucks Studies MS Wills Pec 27/1/69: Will of Joseph Robinson of Aylesbury, tailor, made 28 Feb 1776, proved 19 April 1781. Leaves everything to his wife Elizabeth Robinson. William Turner of Winslow Lace buyer and Elizabeth his wife surrender a Cottage in Tinkers End late in the tenure or occupation of John Evans and now of Thomas Budd. To the use of Robert Eden of Winslow Cordwainer who desires to be admitted Tenant. Rent [blank], fine [blank]. Mary Eden of Whitchurch widow on 22 July last surrendered by Lancelot Wyatt gent. Deputy Steward a piece of ground [as described in 1789] now in the occupation of John Warner and part of the Yard [as above] and a Cottage in Tinkers end now or late in the occupation of Thomas Budd and a Messuage or Cottage in Tinkers End formerly in the occupation of William Jarvis and now of Thomas Kingston, to which she was admitted at a Court on 28-29 Oct 1789. To the use of Samuel Yeates of Winslow Lacebuyer who desires to be admitted Tenant. Rent 6d, fine 10s. Samuel Yeates of Winslow Gentleman in consideration of £24 to him paid by Joshua Lewin French of Winslow Grocer surrendered All that piece of Ground in Tinkers End now in the occupation of the said Joshua Lewin French, containing in length on the West side 65 feet or thereabouts on the South side 18 feet or thereabouts on the east side 73 feet or thereabouts and on the North side 34 feet or thereabouts on part whereof a Cottage or Tenement heretofore in the occupation of William Jarvis Thomas Kingston and Stephen Cook respectively lately stood but since pulled down by the said Joshua Lewin French to which Samuel Yeates was admitted at a court on 28 Oct 1807 on the surrender of Mary Eden Widow. To the use of Joshua Lewin French who desires to be admitted tenant. Rent 2d, fine 5s. Joshua Lewin French of Winslow Grocer and Martha his wife in consideration of £4 paid by Thomas Lomath of Winslow Cordwainer surrendered a piece of Ground in Tinkers End late in the occupation of Joshua Lewin French and now of Thomas Lomath [as described in 1835] to which he was admitted at a court on 26 Oct 1835 on the surrender of Samuel Yeates. To the use of Thomas Lomath who desires to be admitted Tenant. Rent 2d, fine 5s. ROBBERY. – On Friday, the 9th inst., Thomas Cox, of North Marston, was brought before P. Dauncey, Esq., charged with stealing on the previous evening, a writing desk, the property of Mr. Joseph Bowden, landlord of the Boot Public House, in this town. It appeared that Mr. Bowden’s house, upon the night in question, it being the first statute fair, was the scene of a dancing party, with their fiddler, who were keeping holyday in honour of the good Saint Michael, when, whether by design or accident is not quite certain, an interruption occurred to their festive enjoyments by the lights becoming suddenly extinguished, and the assembly room immured in darkness. At this particular juncture, Cox, who was one of the party, availed himself of the confusion which ensued, by decamping with a writing desk. In a very short time Mr. Bowden discovered the loss he had sustained, and allowing not a moment’s unnecessary delay to favour the escape of the fugitive, apprised Mr. Ossett, (who by the bye is no bungler in his profession,) police constable, of the circumstance. Ossett, after a little casting about, found that Cox had gone in the direction of his place of residence, North Marston, he therefore proceeded in company with Bowden to chase the delinquent. On arriving at his domicile, it was agreed that Bowden should by himself alone peremptorily demand the restoration of the desk. Cox had retired to rest, and from his chamber window at first prevaricated with Bowden, but the latter, like the inexorable Shylock for his pound of flesh, would receive no denial, and finally obtained the article. Ossett, who during this altercation had remained in ambuscade, now advanced in order to secure Cox as his fair game, and conducted the plunderer of the paraphernalia of literature to the cage, in this town, from which on the following morning, after an examination as stated above, he was committed to Aylesbury gaol to take his [blank] at the ensuing session. Winslow Petty Sessions, 25 Aug.
On the application of Samuel Rowe, of the Boot, at Winslow, for the renewal licence. Superintendent Thomas, of Waddon [sic], opposed it on the ground that the house was a "Padding Ken," and that on his being in pursuit of John Gilpin for hourse stealing, and of a person for stealing boots, Mrs. Rowe had not given him true information. Mr. Thomas appealed to Police Officer Ossett as to the character of the house. Ossitt [sic] said he looked on it as "Padding Ken." It was explained that a "Padding Ken" is a receptacle for rogues and vagabonds. The magistrates suspended the licence. Winslow Petty Sessions, 25 June. Samuel Rowe was summoned by Hannah, wife of John Stavis, for assaulting her at Winslow on 20th June last. 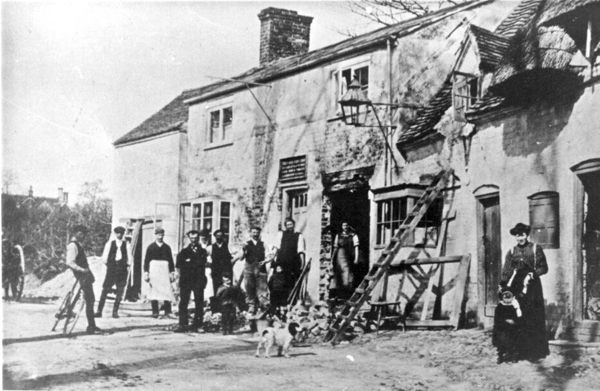 Rowe is the landlord of the Boot public house in this town, and the assault complained of took place on the pitching in the front of his premises by pushing the complainant from the same, for having made too free with the characters of his niece and servant, which, though a peaceable man, made his "dander rise." Dismissed, with a caution to both parties. Winslow Petty Sessions, 10 June. Henry Avis, labourer on the Metropolitan extension, was charged with on the 9th of June maliciously damaging certain property belonging to Thomas King, landlord of the Boot Inn, Winslow; also at the same time and place committing an aggravated assault on the said Thomas King. -- Complainant, who is an old man and blind with one eye, appeared with his face fearfully knocked about ... He had some rough characters to deal with, but had never been treated like this before. Defendant had lodged with him for a fortnight. -- Defendant pleaded guilty ... committed to gaol for one month for the assault, and 14 days for the damage. Deaths. August 7, at the Boot Inn, Winslow, Thomas King, aged 66 years. On behalf of Messrs. Hopcraft and Norris, Brackley, Mr E.J. 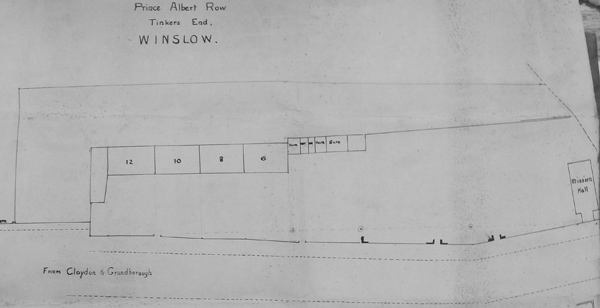 Riley submitted plans of the proposed alterations to the Boot Inn, Tinkers' End, Winslow which was now registered as a common lodging house and it was decided to do away with this. The proposed alterations to the premises included the demolition of the thatched cottage and a portion of the back premises, also the trap house and bottom building at the north end. This would enable the tile cottage, which was in a very dilapidated condition and the kitchen and passage, also the second lodgers' bedroom to be rebuilt on the old foundations. The building would undergo a thorough renovation. The proposed alterations allowed for three bedrooms and the site of the old thatched cottage would add to the yard space. Supt. Callaway said he had inspected the premises and there was no doubt an undesirable state of affairs existed. Two men and two women were sleeping in the same room, with just a curtain as a partition and in another room one man and one woman slept. The rooms were in a very dilapidated state. 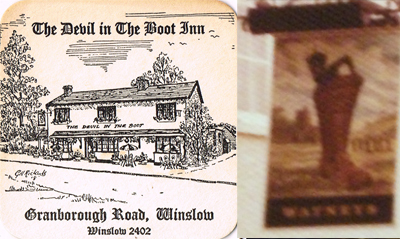 It was renamed The Devil in the Boot in the 1960s after its unique pub sign (showing a green devil peering out of a boot, in the legend of Sir John Schorne of North Marston - unfortunately we haven't been able to find a better picture). It closed in 1997. Short Lane leads from Granborough Road to the land generally known as Hollow Furrow, and then to The Walk. It may represent an early route from the centre of Winslow to Granborough. 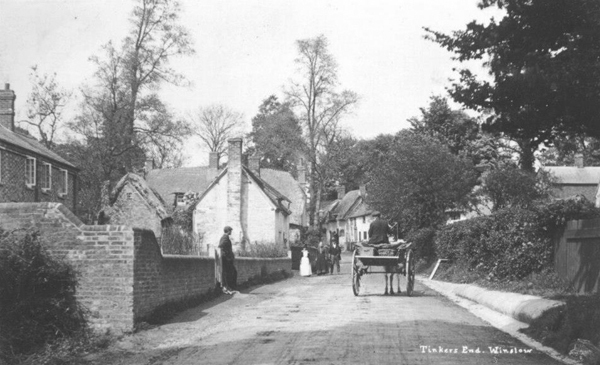 The first official use of the name seems to be in the 1901 Census; previously it was referred to as Tinkers End Lane. The field between Short Lane and The Walk was called Bates Piece from 1850, and presumably took its name from William Bates, tanner, who was living in Short Lane in 1841. The two messuages mentioned in 1769 (alread subdivisions of one messuage) with adjacent land had become 8 dwellings by 1871. In 1946 "Messrs H. and A. Turney" were given permission to build a house on the site (now 7 Granborough Road), by which time all the earlier ones were demolished. Refers to "a certain ancient enclosure belonging to the said Thomas Blake in the occupation of Richard Norwood" (a tanner) which was probably the future brickyard, and "a certain garden adjoining to the dwelling house of Judith Hatton", which seems to have been to the south of it, on the east side of Granborough Road. Benedict Holland heretofore of Hardwick but late of the Elm in the parish of Grandborough while he lived held two copyhold messuages in Winslow heretofore in the occupation of Joseph Tims and Indis Hatton, now of George Orchard and John Grubb, formerly but one messuage ... to part [of his whole estate] he was admitted at a court on 25-26 Oct 1768, to the other parts on 27 May 1791. He died since the last court having made his will dated 7 Jan 1769 devising all the property to George Holland his eldest son who desires to be admitted tenant. George Holland of Hardwick Gentleman and Mary his wife out of court on 12 April last surrendered by Lancelot Wyatt deputy steward those two Copyhold Messuages situate in Tinkers End Lane [as described in 1803]. To the use of John Cox of Winslow Plumber and Glazier. Rent 5d, fine 10s. John Cox late of Winslow Plumber and Glazier deceased held two copyhold messuages in Tinkers End Lane in Winslow late in the occupation of John Grubb and George Walker, since of Philip Walker, Daniel Holt and Thomas Stuchbery, now of William Bates the elder and Daniel Holt, with two cottages some time since erected by John Cox on part of the ground adjoining, late in the occupation of Thomas Budd and Widow Phillip, now of William Bates the younger and George Walker, to which messuages he was admitted at a court on 29 & 31 Oct on the surrender of George Holland. Thomas Cox sought admission under his will. Rent 5d, fine 10s. Lists 2 bedrooms (with at least 6 beds), front room, small room, side room, wood barn. Total value: £5 16s. Will proved 13 Oct; described as yeoman; effects under £200; executors Wiliam and Edwin Gibbs of Winslow, bricklayer. There was a brickyard in Short Lane from at least the 1860s. The land was later sold to Winslow R.D.C., who used some of it as a tip. James King of Winslow, surveyor, lets the brickyard and premises in Tinkers End (for many years and now occupied by John Clarke) to Robert Clarke of Winslow, brickmaker, from 29 Sep 1878 at a yearly rent of £18 10s, with an additional 1s 6d payable for "every thousand of materials made in one year above 200,000". Excluded from the agreement is "a space about 50 feet wide along the east side of the Premises adjoining the property of Mr Dudley". On this plan from 1883, the brickyard is the land belonging to Mr James King. The buildings are probably not shown very accurately. From 29 Sep 1883 William Miller became joint tenant with John Clarke. 1891: note from James King dated 19 March demanding the tenants deliver up possession by 29 Sep. In 1890 King paid Willmore & Bailey £5 on Clarke and Miller's behalf for coal "to burn a kiln of bricks". Some of the goods were impounded by a bailiff on 18 Sep for £24 14s arrears of rent. On 19 Sep Clarke and Miller empowered G.D.E. Wigley to sell their stock in trade: 37,000 bricks, 8,800 pipes, 800 coping bricks, 100 roof tiles. The sale on 30 Sep raised £84 10s 6d, and stock was sold separately for £23 3s 6d. An ENCLOSURE of LAND and Garden Ground at Tinker's End, about 1a. 0r. 26p, with a pavilion and tool shed thereon. Vacant Possession. Vendor: Lucy Midgley of Winslow, widow. Purchaser: The Rural District Council of Winslow. All that small enclosure of land formerly a brickyard and then partly laid down to grass and partly garden ground site ... known as The Brickyard containing 1a. and 26 p. more or less as the same was bounded on the North by the occupun. road or lane leading into the road from Winslow to Grandborough at Tinker's End formerly in the occupon. of Thomas Bull and recently of George Arthur Midgley dec'd. The County Council accepted the tenancy of the land at Shorts Lane, Winslow, as a building materials depot. WINSLOW. The western entrance of this town has been greatly improved, during the past summer, by the erection of a neat line of cottages, in front of which, in a circular niche, is placed a handsome bronze statue of Prince Albert, surmounted by the words "Albert place;" thus is the old cognomen of "Tinker's End" abolished, and the neighbourhood invested with royal dignity. These were probably the best houses in Tinkers End, but the census returns suggest that they were sometimes subdivided. The plan below is from 1921, when they were bought by Miss Helen Monk. Messrs Wigley, Sons & Gambell Have been instructed to Sell by Auction in 3 Lots, on MONDAY, NOVEMBER 28th, 1921, At the Bell Hotel, Winslow, at 4 o'clock precisely, A VALUABLE FREEHOLD ENCLOSURE of Rich ACCOMMODATION GRASS LAND, known as "Peasey Close," together extending to an area of about 6a. 1r. 9p., situated on the outskirts of the Town with frontages to the Claydon Road & Western Lane and comprising some good old Pasture. VACANT POSSESSION of Peasey Close can be obtained on completion of the purchase. A range of 4 Brick and Slated FREEHOLD COTTAGES, with Gardens and Outbuildings, known as "Prince Albert's Row." 2 Brick Panelled and Thatched COTTAGES, with Gardens. The site of the MISSION HALL and 2 strips of GARDEN GROUND. Miss Helen C. Monk, of Winslow, made application for an ejectment order against one of her tenants, William Dormer, of Tinkers End, Winslow, upon the ground that he had fallen in arrear of rent to the extent of £2 16s., the weekly rent being 2s. Application granted, with possession in 28 days. In this image from the 1920s, a brick cottage visible in the earlier photo at the top of the page has disappeared; the porch of the Mission Hall (built in 1889) can be seen immediately beyond the thatched cottage, and Short Lane is on the right in front of the white building. 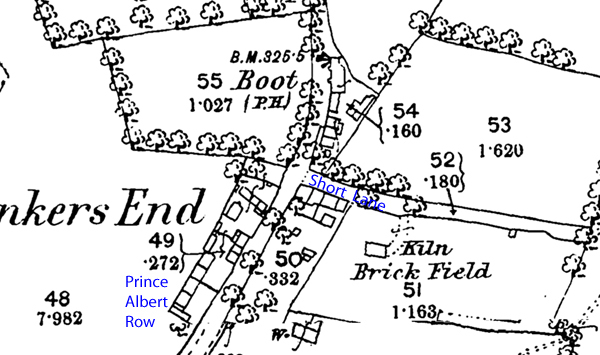 The thatched cottage is still shown on the 1925 map but was demolished before 1939. Mentions "a certain cottage and garden in Winslow aforesaid belonging to Ann Eden widow" on the west side of Granborough Road, which was called Locketts Lane at that point. After the decease of Ann Eden and Ann Osborne, William Osborne of Banbury her eldest son and heir desires to be admitted to the east end of the messuage (heretofore in the occupation of George Thorpe and Francis Evans). Robert Eden bequeathed the west end after the decease of his wife to his daughter Margaret wife of William Earl. Margaret, now wife of Christopher Samuel of Layton Buzzard shepherd, desires to be admitted. Margaret wife of Christopher Samuel of Leighton Buzzard shepherd deceased held the west end of a messuage in Tinker’s End heretofore in the occupation of Francis [sic] Evans and now of John Pennell. She was admitted tenant as wife of William Yirrell by mistake called William Earl at the court on 28-29 Oct 1785 as devisee of her father Robert Eden. She lately died intestate. To this court comes William Yirrell of Leighton Buzzard Victualler eldest son and heir of Margaret and desires to be admitted. Rent 2d fine 5s. In consideration of £15 he then surrendered to John Godfrey of Winslow Cooper. TWO CLOSES OF VALUABLE OLD PASTURE LAND, containing 2 Acres and 39 Poles, with a small convenient Farm Yard and Buildings, and TWO COTTAGES adjoining in good repair, in the occupation of Mr. James Hazzard, and his under tenants, at the yearly rent of £19 5s., in the Parish of Winslow, adjoining Claydon Lane. The Property is Freehold and Tithe-free, and the only outgoing is a small Land-tax of 4s. The Land is of first-rate quality, and in excellent cultivation, with good fence well-stored with thriving Timber, and a plentiful supply of water, and the situation will always command a tenant at its full value as accommodation land. For a View apply to Mr. James Hazzard, and for further Particulars to Messrs. Gem and Docker, Solicitors, Birmingham; D. T. Willis, Esq., Solicitor, or Messrs Dudley and Son, Auctioneers and Land Agents, Winslow. A small iron mission room has been erected in Tinker's End, at the expense, we understand, of Mr. H.J. Chinnery, and was consecrated by the Bishop of Oxford immediately after the confirmation service on April 3rd. TINKER'S END HARVEST FESTIVAL. By special request of the inhabitants of this part of the parish, a special service of thanksgiving for the harvest was held on Tuesday, Oct. 21st. The little Mission Hall, in which there has been going on ever since its erection quiet, earnest, devoted work, principally conducted by two laymen, was most tastefully decorated. Most willingly did the organist and choir of the Parish Church render their services, and by means of their help was held quite the brightest and heartiest service which has taken place in that locality. The choir in their surplices went in procession from one of the cottages to the Mission Room, which was more than filled, a large number being compelled to remain outside during the whole service. The sermon was preached by the Vicar, and the service was concluded by the singing of the Te Deum. The Medical Officer of Health reported that two houses in Tinker's End, Winslow, and occupied by Mrs. Holt and Mrs. Warner, were in a most filthy condition, whilst one woman had six children and the other seven. -- Mr. Hathaway, Inspector of Nuisances, said the houses were in a bad state of repair. The ceilings were black and the floorings were bad ... Mr. Hathaway did not consider that in their present condition they were fit for human habitation, but this could be remedied. There were too many persons living in them. In Mrs. Holt's house there were two rooms downstairs and one upstairs, and the children slept upstairs and the woman downstairs. Warner's cottage was not quite so bad, it having two rooms upstairs and two downstairs. -- Mr. Vaisey said he did not think the houses were bad enough to be pulled down ... The cottages it appeared belonged to the Chairman (Mr. Monk), and he now intimated that he intended to have them pulled down, and he requested the Inspector to give the occupants notice to this effect. Winslow Board of Guardians. TINKER'S END COTTAGES. Mr Hathaway, Inspector of Nuisances, attended with his report. He said that he had delivered the usual notices to Holt and Warner to leave the cottages in Tinker's End. Warner had left, and Holt would do so as soon as he could procure another house. The Chairman told Mr Hathaway that he must press the case. I devise unto my Daughters Helen Monk and Clara Humphrey as tenants in common my Cottages and Gardens and the Iron Room in Tinkers End Winslow my Close called "Peasey Close" and my Closes called "Parrotts Closes" in Winslow. Churchwardens' accounts: ground rent, Tinkers End Mission Room, 10s 6d. At the Winslow S. Laurence Parochial Church Council meeting on Easter Tuesday evening, Mr. Norman McCorquodale, Vicar's Churchwarden, offered to provide all the necessary materials for painting the Tinker's End Mission Chapel, Winslow, and appealed for volunteers among the young members of the congregation who would carry out the decoration. Tinker's End approach to Winslow was becoming very important, he said, and it was time that the Mission Church was got into better condition.